This full day event was held at our St. James school location on Saturday, April 29th, 2017. Thank you to all of our participants who were a part of this day with us. Educators travelled from Grassy Narrows, Devlin, Atikokan, Marathon, Red Rock, and many were from Thunder Bay. This amazing day started with Kelly Massaro-Joblin as our keynote speaker. Kelly has been in the field of Early Childhood Education for over 35 years, and is the past director of Schoolhouse Playcare. She has taught E.C.E. courses at the post-secondary level, and has presented locally, provincially and internationally! Currently, Kelly is a Child Care Advisor in the Early Years Division with the Ministry of Education. Thank you for inspiring us during this event and always encouraging and supporting us to continue to learn. Following this, participants broke into small groups and were part of hands on learning groups that focussed on observation, putting it into practice / provocation, and documentation. These learning groups were fascilitated by the educators of Schoolhouse Playcare Centre, a talented group of individuals, professional and passionate, who are committed to providing quality care and learning for young children. 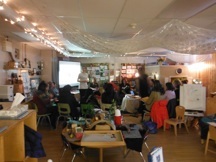 This was a time for networking and guided discussion amongst professionals working in early learning programs. The last session of the day was our Atelier Exhibit where participants were involved in an interactive exhibit featuring a 'loose parts' gallery, light tables and transparency displays, children's representations, documentation samples and more!